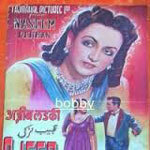 "Ajeeb Ladki" is a 1952 hindi film which has Rehman, Naseem Banoo, Shashikala, Cuckoo, Agha, Jayant and Shyam Kumar in lead roles. We have 2 songs lyrics and 2 video songs of Ajeeb Ladki. Ghulam Mohammad has composed its music. Lata Mangeshkar and Talat Mehmood have sung these songs while Shakeel Badayuni has penned its lyrics.